As a London commuter, I’m constantly trying to arrive somewhere as quickly as humanly possible. I scour tube maps to establish the most direct route, shout at taxis that miss my slightest gesture and curse buses, only three minutes apart that deign to shut their doors on me. Last month my obnoxious city-slicker attitude reached a crescendo. I had become that person standing at the train door and hollering aggressively, ”Move down!” No please. No thank you. Only the faintest hint of ‘tsk’. It was time to have a strong word with myself. The only antidote to my brutishness was to recall journeys that weren’t all about the destination. This is my pick of voyages where you won’t find yourself asking; Are we nearly there yet? When you hop aboard this narrow boat, with its colourful foam-clad seats and basic toilet facilities, the prospect of two days afloat is daunting. 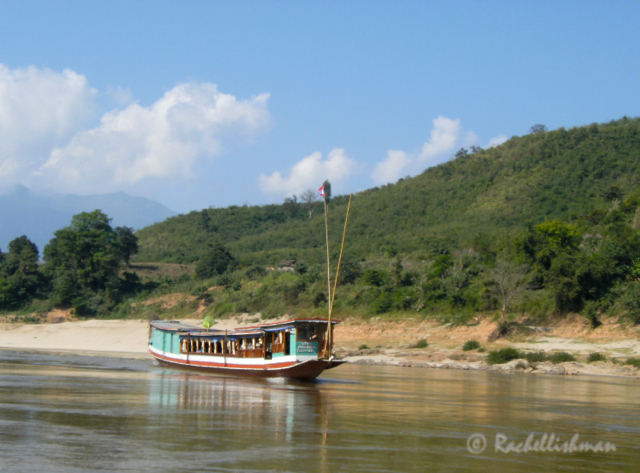 However, you quickly become accustomed to the slow push of the motor and the subdued pace of Mekong life. In between novel reading, time’s passed perusing the banks. Farmers roam with their livestock to find new pastures; village children splash in the warm shallows and every so often, shards of gold sparkle atop Buddhist shrines and cave-like temples. An overnight stop at Pakbeng offers a bed, dinner and somewhat surprisingly – nineties karaoke. A full 48 hours later, a trip that starts as a formidable task, ends in a reluctance to return to land. As the sun sets behind the tree lined banks of the Thai border land, passengers snooze, laugh or merely gaze into the distance. No one swears because it’s arrival is over an hour late. A caveat is required here: This is a mammoth journey, even for willing wanderers. Bring food, cards, books, a camera, wet wipes and your best stamina. 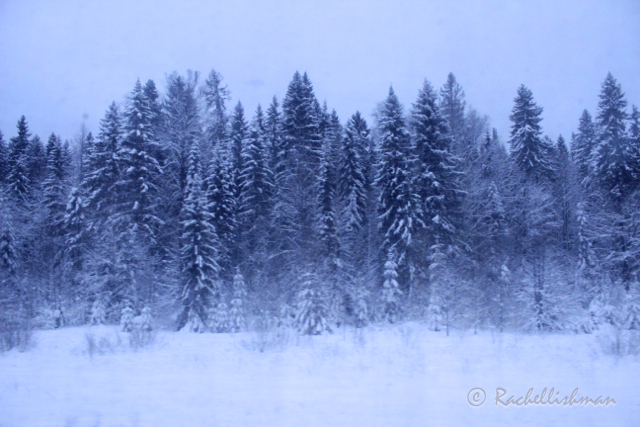 The hot-cold experience of the Trans-Siberian takes some adjustment. Slippery winter platforms at -20 degrees contrast with the stuffy innards of the carriages. As snowy landscapes flit past the windows, you will be reclining on a bunk in shorts and T-shirt, probably consuming a noodle-based dish. The four and a half days to Moscow pass in a blur of long, dark nights, short sharp platform breathers and trips to the dining car. My top tip? Make friends with the Prodvonista (train manager) immediately through chocolate bribery – this trip is much more enjoyable if she is your new best friend! It takes about seven hours to drive non-stop from the large country town of Don Benito in Extremadura to the ancient Moorish stronghold of Cordoba in southern Spain. Though of course, this isn’t the point. This picturesque sojourn will take you to some of the prettiest historical cities in Europe. From the flamenco shows and calming Giralda of Seville, to the snow-capped Sierra Nevada mountains and the majestic Alhambra Palace in Granada. In early medieval Spain, the Moors occupied this entire region. They built ornate palaces, mosques and established civilised cities throughout the south. Bringing new foods, cultural practices and learning to Spain. When the Christian Spanish re-conquered modern-day Andalucía in the 1400s, they often considered the buildings too beautiful to demolish. 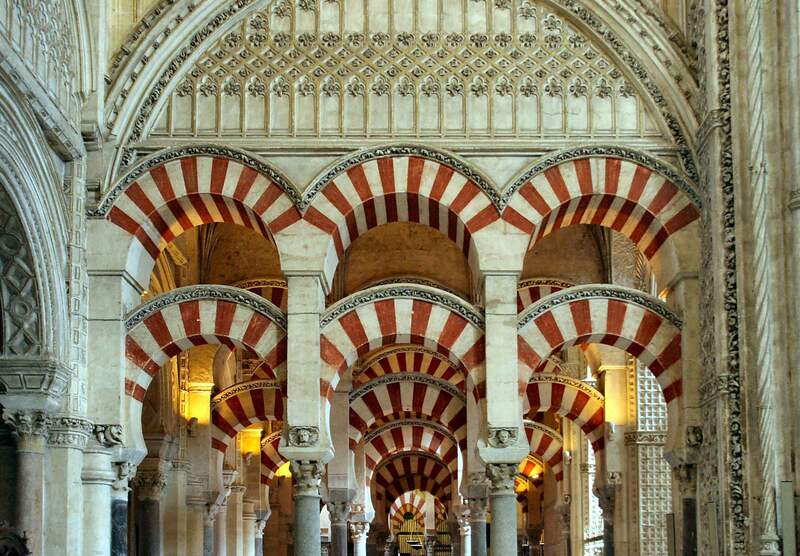 Inside Cordoba’s Mezquita that has transgressed from church to mosque and back again, a small Christian altar is nestled within beautiful Islamic architecture. While most tourists in Spain only see the coast, this drive is so memorable that you’ll feel slightly disappointed to arrive there! The movements of a camel are extremely lethargic. Their nonchalant blink through thick white eyelashes, the way they haul themselves up from the dusty earth in a series of rocking efforts and their weary lollop over huge sand dunes that turn them into dots on a sharp backdrop. A breeze-blocked building propped comfortably in the middle of nowhere is the unceremonious starting point for an overnight desert trek. With a headscarf wrapped expertly around your face to shield your eyes from blowing sand, your camel slowly carries you through the upper Sahara desert. 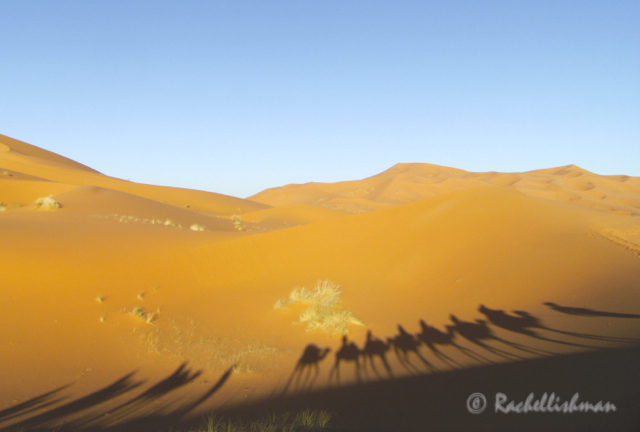 A few sedentary hours later you arrive at your destination – a small circle of tents manned by Berbers. The night you pass on a mattress under the stars is a story in itself, but as the sun warms up the early morning sand on your return to relative civilisation, every quiet moment is worth savouring. Travellers’ shadows become upright and sharply outlined as the sun reaches its peak. Far from being impatient to return back to the breeze-block base, you instead will your new friend to lollop even slower, or even turn around. All good journeys however, must come to an end. An ultra-modern double room comes complete with computerised toilet, a 9th floor view, plasma screen TV and the prospect of an unlimited buffet dinner in the restaurant below. Diners look upon futuristic roads built over a colossal estuary, with fantastically lit bridges linking different areas of the city. Even in the full throws of an aggressive winter, Incheon has a certain bizarre charm. On the return to the airport, under steely daylight the landscape looks eerie and unforgiving, yet you won’t want to leave. Sheets of ice lick the watery edge of the estuary’s tributaries and giant oil tankers stand statuesque within the mist. Incheon Airport regularly tops worldwide polls, and it’s easy to see why. With several hours to kill before onward flights, visitors can take part in Korean painting and history lessons, dipping a final frosty toe into South Korea’s vibrant culture. On Foot: The Inca Trail from Kilometre 64 to Machu Picchu. If places really took people’s breath away as much as you read about, then many round-the-world-trippers would drop dead through lack of oxygen. In reality, there are very few sights that force a deep gasp of sudden breath. Dawn at the Sun Gate is one. Maybe it’s the body’s reaction to four days of hiking at altitude with minimal sleep, or maybe, just maybe Machu Picchu really is breath-taking. A gushing river passes narrowly under a wooden footbridge. You get your passport stamped, your photo taken and you leave. After following the water for a few hours, the path veers upwards from the valley and weaves its way through the snow-capped peaks of the Andes. 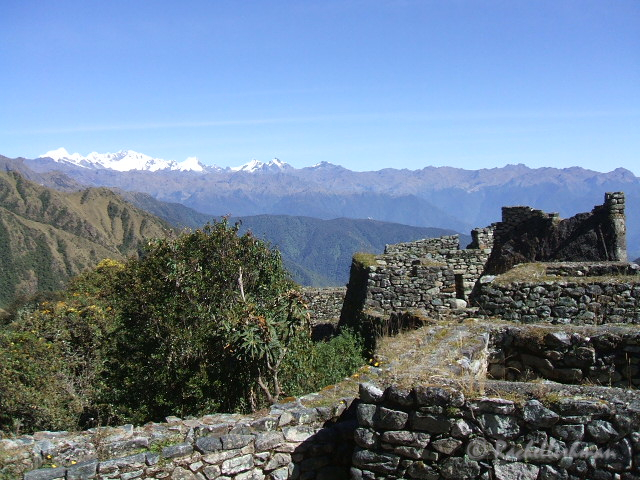 Inca-laid stone steps, worn and rounded from half a millennia of walkers, guide the way. Elsewhere, nudged into steep slopes and delicately perched on jagged summits, glorious ruins of this ancient civilisation remain proudly intact. By night, tents are pitched on high plateaus amid the looming ascents of the next day. When a mid-morning glow finally penetrates the lower valleys, hikers are already scaling the balmy high passes of the trail. The final day starts at 3.30am. A head torch leads the way, three feet at a time. On the left, branches spring from the darkness to brush arms. To the right: nothingness. Then dawn breaks. The huge expanse at the edge of the path transforms into a humbling vertical cliff edge. Verdant gullies slough away to a distant cluster of buildings within the valley. A pallid primrose sky pricks the summits with individual sunlit dots. In the spirit of this post, this isn’t Machu Picchu itself, but one of the many ruins you can see on the way there!